NASA/CXC/Pontifical Catholic Univ./F.Bauer et al. NASA’s Chandra X-ray Observatory has detected a mysterious explosion in deep space and, although astronomers have some suspected causes for the incredibly powerful event, there’s a possibility that it could be something we’ve never witnessed before. The signal is the deepest X-ray source ever recorded and it appears to be related to a galaxy located approximately 10.7 billion light-years away (it therefore happened 10.7 billion years ago, when the universe was only three billion years old). Over the course of only a few minutes in October 2014, this event produced a thousand times more energy than all the stars in its galaxy. Before that time, there were no X-rays originating from this location and there’s been nothing since. 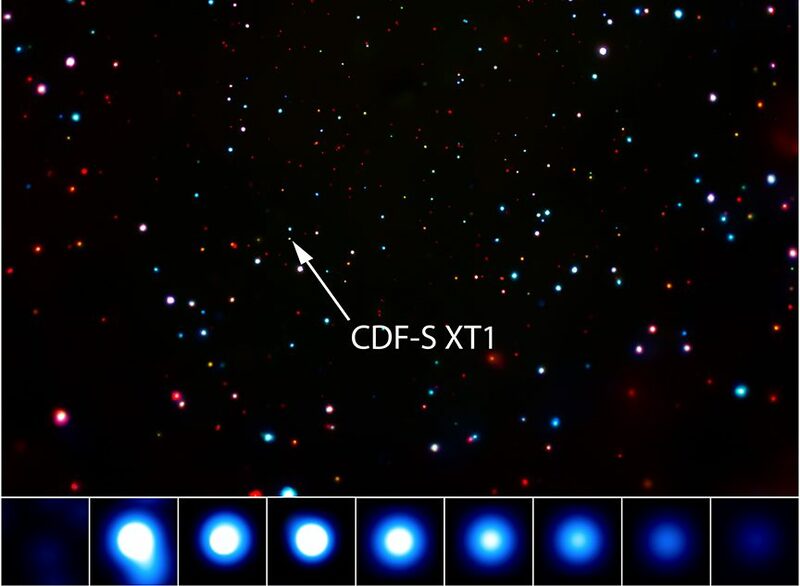 The explosion occurred in a region of sky called the Chandra Deep Field-South (CDF-S) — the event was therefore designated “CDF-S XT1” — and archived observations of that part of the sky by the NASA/ESA Hubble Space Telescope and NASA’s Spitzer space telescope revealed that it originated from within a faint, small galaxy. One possibility is that we could be looking at the effects of a huge stellar explosion, known as a gamma-ray burst (GRB). GRBs are caused when a massive star implodes and blasts powerful gamma-rays as intense beams from its poles — think super-sized supernova on acid. They can also be caused by cataclysmic collisions between two neutron stars or a neutron star and black holes. Should one of those beams be directed at Earth, over 10.7 billion light-years of travel, the gamma-ray radiation would have dispersed and arrived here at a lower, X-ray energy, possibly explaining CDF-S XT1. Alternatively, the signal may have been caused by the rapid destruction of a white dwarf star falling into a black hole. Alas, none of these explanations fully fit the observation and it could, actually, be a new phenomenon. So, in short, watch this space. The research will be published in the June edition of the journal Monthly Notices of the Royal Astronomical Society and is available online.